all accessible from the Juneau road and trail system, provides for extensive and diverse birding opportunities. The Mendenhall Wildlife Refuge and Juneau airport wetlands together provide some of the best and most accessible birding habitat in Juneau. The combination of easy access, great visibility, and transitional habitats, including the mouth of the Mendenhall River, all lead to productive birding. During the peak of the spring migration in May, thousands of birds are present. Drive to the end of Radcliffe Road at the west end of the Juneau Airport, park your car and take the path around the end of the airport runway adjacent to the Mendenhall River. The walk along this pathway and forays into the intertidal wetlands and hikes to the mouth of the river can be productive any time of the year. You never know what you might find. Point Bridget State Park and Cowee Creek, located about 41 miles north of Juneau, and near the end of the current road system, is a diverse mix of forest, meadow, riverine, and marine habitats. The state park trail lead down through muskegs and into wet forest, then along the edge of the Cowee meadow. When you reach the mouth of the creek, you can look out towards Berners Bay. Birding in this area requires a greater commitment of time given the drive and associated hiking involved in a visit. However, those that make the effort are often rewarded, with species such as Townsend's Solitaire, Northern Goshawk, Warbling Vireo, Common Yellowthroat, Three-toed Woodpecker, and more. In 1997, Juneau's first documented record of Red-eyed Vireo came from here. If it is bug season, hikers here should be prepared. Also, if spawning salmon are present in Cowee Creek, people should be on the alert for bears. Both black and brown bears frequent the area. Eagle Beach at the mouth of the Eagle-Herbert River Drainage is located 29 miles north of Juneau via the Glacier Highway. This extensive intertidal mudflat on the eastern shore of Lynn Canal is a wonderful place to view shorebirds, gulls, waterfowl, and seabirds, as well as marine mammals. The Chilkat Peninsula on the western side of the canal provides a magnificent backdrop to it all. 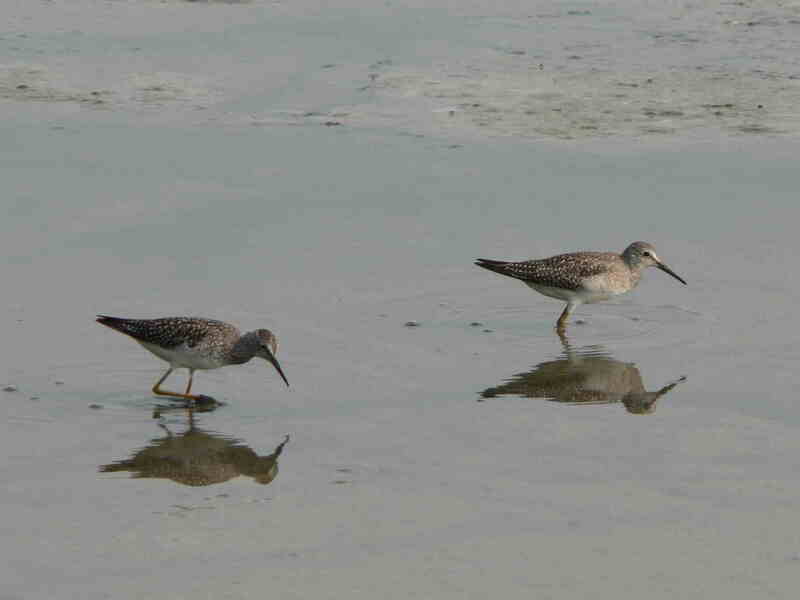 Spring migration is a great time to watch the tide book and hit the flats when the area is available to shorebirds for feeding. Look for godwits, or Red Knot mixed in with the many peeps and dowitchers. As summer progresses and fall approaches, large flocks of gulls will challenge any birder. There is always the chance for a rarity here. Amalga Marsh, adjoining Eagle River, is a rich inland wetland that has only recently been discovered as the bird-rich area it is. Take this hike anytime from late May to early August. Start out from Mile 28 of the Glacier Highway at the beginning of the Eagle River trail. It takes approximately 45 minutes to one hour of steady walking to reach the marsh. On the way to the marsh, the trail goes through impressive stands of old-growth forest. While walking through the old-growth, listen for Pacific-sloped Flycatcher, Townsend's Warbler, Brown Creeper, and Golden-crowned Kinglet. Once at the edge of the marsh, look for Common Yellowthroat, Red-breasted Sapsucker, Red-winged Blackbird, Red-tailed Hawk, and more. The biggest birding treat is the possibility of hearing a Sora, or possibly even a Virginia Rail. Both species have been here over the last several summers. Be prepared for bugs and the possibility of encountering a bear. The Mendenhall Glacier forelands in front of Mendenhall Lake is an area in ecological succession after the retreat of the glacier. There are numerous ponds and small lakes and dense deciduous shrubs and trees. A variety of species of birds rare in most of the Juneau area are regularly found here, including: American Redstart, Northern Waterthrush, Vaux's Swift, Gray-cheeked Thrush, and Warbling Vireo. This area can be accessed from the Back Loop Road, next to the Mendenhall River bridge, the end of Dredge Lake Road, or at the glacier visitor's center. There area many interconnecting trails which can lead to confusion for hikers. It is easy to get turned around and temporarily lost, if you aren't careful. People wanting to learn more about where to find birds in the Juneau area should obtain a copy of A Birder's Guide to Alaska, by George C. West. This birdfinding guide, published by the American Birding Association, has an excellent chapter on Juneau, written by local birder Steve Zimmerman.